This is a guide on how I play Li-Ming and thus the guide reflects upon my play style. There are many ways to play Li-Ming and there is not just one correct way to do so. I am simply sharing how I play Li-Ming. Do you require the aid of a wizard? Hi! 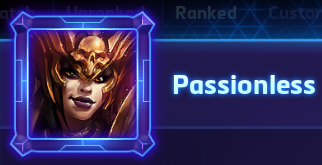 I am Passionless and this is my guide to Li-Ming. I was 3.1k+ in Season 1 and had a 67%+ WR with Li-Ming across all modes and days(>75% HL only all days). I haven't played much HL in season 2 other than my placements (of which I lost my first 5 games :/) and a couple games but as of now my winrate with Li-Ming is 65%+ across all modes and days (>70% HL only this season). I've played Li-Ming since her missile structure damage nerf and have mained her since. Li-Ming is pretty much the only hero I main and is one of the few heroes that I play (the others being tyrael, tlv, aba, brightwing, lili). Contrary to what everyone else does I play Wave of Force over Disintegrate, with the former having been picked ~200 times while the latter ~60. I do not consider myself to be the best Li-Ming player, but I do think I'm in the higher end of the spectrum skill and knowledge wise ( I was #11 Li-Ming in season 1 according to hotslogs). Anyways, the purpose of this section was to attempt to show my credentials and to let you ponder if its worth reading the rest of this guide before you invest your time doing so. *sighs* Do we really have to do this? As I've previously stated, unlike most Li-Ming players, I tend to go WoF over Disintegrate, but in this section I will try to (to the best of my ability) be unbiased between the two, and provide you with the knowledge on which to choose. Disintegrate shines when you can let it run to get the most value out of it. So for wombo combos, this is the definetly the pick. In addition, its great for when you need more overall damage instead of more burst. Against beefier line ups, you will have a much more easier time resetting with Disintegrate than WoF. With this being said, missiles build is probably the best build to go with this heroic. Wave of Force is great against and with dive comps. It also has good flexibility and offers alot of utility. Its also the more bursty of the 2 heroics so if you're faced with a very squishy comp you'll be resetting very easily with this. With that being said, here are a couple things to keep in mind about the two. Both can be used as finishers. It really doesn't matter which you pick, if you land you're abilities on the right target, either heroic will grant you the reset (although generally you'll have a much easier time resetting with Dis due to the fact that you can let it run its cast time for more damage). However, the uses outside of resetting is where the 2 heroics differ. Outside of resetting disintegrate can be used for mainly 2 things. 1 is to clear waves. The other is to zone, although keep in mind this is not probably the wisest use for the heroic as you just put your reset securer on a 30 second cd.But do not forget it can be used as such. If you find your team in an unfavorable position and you have enough range between you and the enemy, feel free to cast it to ward them away. Most people's first reaction is to run away and even if they're full health, they'll try to avoid it out of habit, which might buy your team a few precious moments to gtfo. As for wave of force, it too can be used for wave clear although its not as good at it as dis is. However, it can also be used for peeling, engaging, guaranteeing skillshots, cancelling channels, and basically making plays (as well as offering a higher skill ceiling) and its for these reasons outside of simply being a reset securer that I tend to pick WoF over Disintegrate (although both are very good heroics). Magic Missiles- Fire three missiles toward an area, each dealing heavy damage to the first enemy hit. This spell is pretty straightforward. However keep in mind that the missiles will be launched towards a point you select and will go past that point if it hasn't reached it max range yet. In addition, if you aim far enough, the missiles will not even intersect (the further you aim the more parallel they will run). Keep this in mind when you don't need all 3 missiles to hit on a target. Arcane Orb- Fire an orb that powers up as it travels, dealing heavy damage to the first enemy hit. The further the orb travels, the harder it hits—up to massive damage at maximum range. The further the orb travels, the harder it hits—up to massive damage at maximum range a certain range before the maximum range. 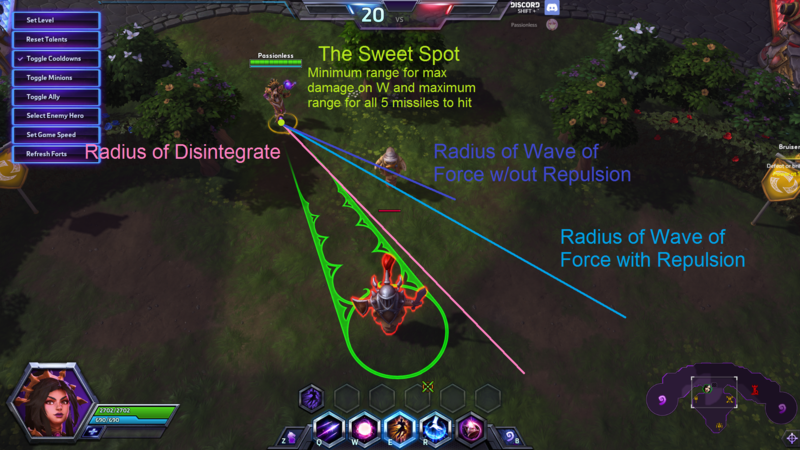 You do not actually need to be at "maximum range" to get max damage out of W. Refer to "The Sweet Spot" diagram I created above, that is the minimum range you need to be at to get max damage out of W. You should always try to be at the sweet spot when playing Li-Ming. Before they nerfed the orb radius the minimum range was actually longer than it is now so you had to walk forward to land all 5 missiles (with mirrorball), but that is no longer the case. Teleport- Teleport a short distance instantly. This is probably the most misused ability out of the 3 basic abilities. For some reason, people have the urge to teleport forward. I used to think these were just low-elo mistakes, but after seeing several "Grandmaster" Li-Ming users teleport to their deaths (tfw "grandmaster" teleports into ring of frost and disintegrates) I've realized some people just don't know how to use it. This is a repositioning tool. You use it to get to a better position, not to TP to your death or to calamity into the middle of the enemy team and Disintegrate. Yes you can spec it for damage, but even if you take calamity it is still a repositioning tool unless you can get a reset in which case you can use it for damage. With aether walker you can also use it to get free cannoneer stacks. A taste of the arcane! Disintegrate- Channel a powerful beam, dealing massive damage over 2.5 seconds to enemies caught in it. The direction of the beam changes with your cursor’s position. You do not start a fight with Disintegrate. You will want to save Disintegrate to secure a reset or to fill a cooldown (as in both you're W and Q are on CD) in a team fight (not at the beginning), but you'll only want to use it as a filler if you are desperate for damage. In most situations, you will want to cancel Disintegrate as soon as you get the reset, of course if the enemy is just clumped together then you can let it cast as you'll get decent DPS out of it, but if this is not the case you will want to cancel and use you're other abilities, because you do more DPS with them. Watch your positioning before you cast it, you don't want to Disintegrate in the middle of the enemy team unless its just for a brief moment to get a reset, but then again, if you're in the middle of the enemy team you should be thinking "Should I even be here?". Usually you'll want to be off to the side (at min W range for max damage, or somewhere close to that) when you cast it so that you don't have to move much to land your W and Q after you get the reset. Wave of Force- Knock away all enemies from an area and deal heavy damage. So WoF faces an issue that Disintegrate does not have in regards to resetting... you can't let it run its duration for more damage. What does this mean for us? It means we need to be careful how we use it to finish because if you miscalculate and positioned incorrectly you might just have saved an enemy's life. While they may be out of the fight, that is a reset you didn't get so you'll want to be careful with using WoF. Now you can remedy by positioning the heroic so that the enemy is pushed towards you. This way, even if you do end up miscalculating you can still finish them with an AA or off cooldown Q. However, if they are low enough and you are sure you will get the reset then you can just cast it when you can. I will say that if you are using WoF as a filler (your other abilites are off cd and you need damage), that you should be aware of your teamates, because you might cause your allies to miss their abilities (I can tell you I've accidentally WoFed an enemy out of my friend's precision strike several times... but they died anyways so who cares :P). So unlike Disintegrate, you can start a fight with your heroic and that's what I'll be talking about first in this section. Anyways, WoF can be used to engage or to get a pick. So the way WoF works is that enemies are pushed away from the center of the circle which means that if you position it correctly you can push someone into your team or better yet, push someone into your team while pushing the others away. Do not underestimate this use, especially with repulsion. You can win the game with one good WoF, so don't be afraid to use it for that. In the same way you can use the knockback from WoF to engage, you can also use it for peel and disengaging. In this situation, you want to place WoF so that they are pushed away from you/your teamate. A third use is to guarantee your skillshots. In the same way you can push enemies towards and away from you, you can also use it to push them into your abilities. There are a few things you want to keep in mind when you use WoF. The first is that it is not an instant cast (as in the push gets applied as soon as you press R). There is a short delay between the two as when you press R, Li-Ming conjures an image of herself to slam the ground you targeted. You need to take this delay into account if you want to do any of the above (engaging, peeling, etcetera). So keep in mind that when you position it because if they move enough, instead of knocking them towards you, you may knock them away. You also want to watch out for casting it too early if you're using it in a combo because you may push them out of your abilities. Green: In my opinion, these talents are the best (or one of the best) in their tier. Red: These talents aren't necessarily terrible, but the others in the tier are better options. Highly situational. Astral Presence- Your Mana regeneration is increased by 100% while below 25% Mana. Deals with mana, will let you stay in a fight infinitely (although resets won't be as effective if you are oom). I choose this if I see fights lasting longer than power hungry proc. Basically if objectives are away from lane (at least far enough so that you can't grab another globe), take this over power hungry. Power Hungry- Regeneration Globes restore 100% more Mana and grant 10% Ability Power for 20 seconds. Force Armor- When Magic Missiles damages an enemy Hero, you gain a charge of Spell Block, reducing the damage from the next enemy Ability against you by 50%. Can hold up to 4 charges. Can only gain 1 charge per cast. Remember, red doesn't necessarily means its bad (it can mean that, but in this case it means its highly situational). You only need this to mitigate huge burst that may not be easily dodged, if you can dodge the burst then take another talent. 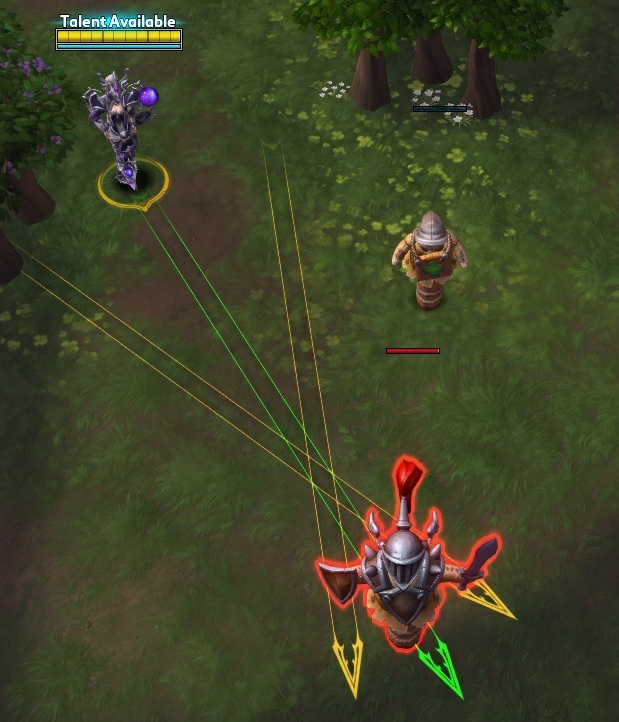 I would take this against a temporal loop Chromie, Zeratul, and maybe Nova, but outside of that I'd pick others. I don't think Falstad Q is enough to warrant it (I say this because I hear a lot of people saying they take it for this) because you can literally sidestep or E out of it. Its not like temporal loop where you're [email protected]#$$ed if you don't get invuled/cleanse (unless bad chromie) or Zeratul who just blinks on you. Aether Walker- If you haven't taken damage in the last 5 seconds, Teleport costs no Mana and its cooldown is decreased by 2 seconds. Green if you are for sure going for calaming as Free E's. This also deals with mana and will allow you to reposition for free (and frequently) so you can consider this even if you are taking seeker or zei. If you're going AA, this is also gives free cannoneer stacks. Charged Blast- Basic Attacking a target recently hit by a Magic Missile does an extra 90.48 (+4% per level) damage. This is the only talent in this tier that will increase your damage (although you could argue triumvirate does as well, I mean it in the sense of burst/short run). Taking this talent also increases the skill ceiling which is good. The only reason this is marked yellow is because the skill floor for this talent is higher than the other two and also because you won't be getting the heals from dominance so positioning becomes much more important to mitigate damage and you really have to be careful if you're support isn't reliable. Triumvirate- If Arcane Orb hits an enemy Hero after traveling at least 50% of its base range, the cooldown is reduced by 50%. Dominance- Takedowns restore 20% of your maximum Health. Seeker- If three Magic Missiles hit the same target, the third one deals an additional 130 (+4% per level) damage. Gives your missiles nore burst. Choose this over calamity if you're against a beefier team or fat heroes/assasins (hitboxes). I'd refrain from choosing this if you are against movile heroes or with heroes that can have constant summons to block your skillshots. Note the map as well because it might not be the best talent on shrines where the objective spawns units to block your shots (although you still can pick it if you think its ok, I do it too). Zei's Vengeance- Arcane Orb does up to 25% more damage to enemies based on distance. Additionally, its cooldown is reduced by 2 seconds. Calamity- Teleport does 309 (+3% per level) damage to enemies near your destination. Gives you another damaging spell. That is the reason why calaming is the most popular build and is the only build some (more like alot) Li-Mings play. You can't blame them though, calamity is really good. It adds another damaging spell for resets, is aoe, and gives you wave clear. Its also much easier to chain reset with this because its really hard to miss unlike if you went seeker, where you would have to land your missiles to get another reset. My friend has linked me several gifs/images of people mashing their keyboard with the caption "Calamity Li-Ming in action" and... its true, you can literally mash your keyboard and still probably chain resets with calamity ming because it takes so little skill (this talent has the lowest skill floor in this tier), the only thing you have to do is that if you take WoF, make sure to press R last. Disintegrate- Channel a powerful beam, dealing 462 (+5% per level) damage over 2.5 seconds to enemies while they are in it. The direction of the beam changes with your mouse cursor position. Wave of Force- Knock away all enemies from an area and deal 168 (+5% per level) damage. Cannoneer- When you use an Ability, increase your next Basic Attack by 75% and cause it to deal Ability damage. Stacks up to 3 times. Gives significant damage to your AAs especially when combined with charged blast. The 3 stacks are very easy to get and you'll get them without even worrying about it. You probably only want to AA if you have 3 stacks + charged vlast proc because AAing with every stack you get takes too much time. Glass Cannon- Increases your Ability Power by 15%, but decreases your maximum Health by 15%. More ability power=more damage on your spells. The 15% health reduction can be ignored if you have good positioning. Good with missiles/orb builds where you want to do more damage but don't want to be in AA range to AA. Illusionist- Increases Teleport range by 50%, and if you lose more than 20% of your Health at once, its cooldown is instantly refreshed. This cannot happen more than once every 4 seconds. Increases your teleport range so you don't have to be as close if you want to calamity in. The increase range can also help you with feeling. The CD refresh if you take 20% of your health as damage at once is good. Fireflies- Drastically increases Magic Missiles speed. Its cooldown is reduced by 1 second, and its Mana cost is reduced by 5. I feel as if this talent is underrated. Yeah it doesn't give you the 2 extra missiles mirrorball gives you but increased projectile speed, reduced mana, and redcued cooldown are very good benefits this talent offers. It makes seeker procs easier and will also let you proc seeker more. This will also allow you to get more charged blast procs faster. It makes landing missiles very easy, especially at close range. Mirrorball- Magic Missiles fires an additional 2 missiles, but its Mana cost is increased by 5. More missiles for more damage. You take this if you plan to hit all 5. Some people tell me they take it because, it makes proccing seeker easier because you have 5 missiles and only need to land 3. And while that may be true the only time that actually happens is if you threw it at a wierd angle so 3 missiles from one side landed and those on the other side missed. The reasoning to taking it to make getting seeker proc easier is a poor one because as I've said the missiles shoot towards a point, its not some wierd "goes in random directions projectile" where having 2 more will increase your chances of proccing seeker. If that is what you're aiming for, fireflies is much better as it increases projectile speed and reduces cooldown. However, that reasong aside, the 2 extra missiles will give you nore burst, just remember that you want to land all 5 (remember the sweet spot). Arcane Orbit- Arcane Orb travels 25% farther, doing up to 25% more damage. This talent (imo) is what makes full orb bad. It is just so unsynergetic because by taking this none of your other abilities will ever be in range. It encourages you to play really far back and resets don't mean much since its only another W. Blizz keeps making all these changes to zei and tri to make full orb good, but they need to change this talent because at its current state its very bad. You are depending more on your opponents lack of skill than your own skill, because, lets face it, the opponent has to be some kind of special to eat a max damage arcane orbit orb unless you're repulsioning them into it but then with that you have to wait till 20. There are things to make it harder to dodge. One is to be at weird angles. Take advantage of fog of war/unpathable terrain that blocks vision because the less time they see the orb coming at them the less time they will have to react to it. If you are throwing it when they can see it and you land it (max damage that is)... well... gratz on the freelo. Diamond Skin- When you Teleport, gain 20% of your maximum Health as a Shield for 4 seconds. Nothing much to say about this other than its a defensive talent if you need it. Temporal Flux- Disintegrate gradually slows enemies caught in its beam, to a maximum of 60%. I don't have much to say about this... I've only picked it twice. I will explain why I don't pick it and why I marked it red, but I may very well be underrating it so I highly encourage you to try out this talent and come to your own conclusions. I don't pick it because by reading the description and also the 2 games I played with it, it is very underwhelming. Keep in mind I've only taken it post May 17 where they screwed talrasha (and this talent), the previous version might have been good but the current one is... meh. The reason I say this is because disintegrate is mainly for finishing or for wombo, so if you're playing properly there is no reason you'd need the slow to kill them/maximize value. And the thing is you need to let dis run if you want to get max slow, which I generally don't. You are much better off picking tal rasha for more damage or even archon. Repulsion- Increases Wave of Force knockback distance by 150% and increases its cast range by 100%. Using Abilities grants 5% Ability Power, to a maximum of 20%. This bonus is reset when the same Ability is used within a chain. Pre May 17 change this would've been green and would be the definite go to for disintegrate and could even contend with repulsion at 20 for wof. However I think blizz did a bad job, you're probably never getting the 20% unless you're trying to get it (which forces you to do stuff you don't want to). Most of the time you'll be hovering 5%-10% bonus, which isn't that bad, but the old one was definitely better. "Wait, temporal flux is red but this is yellow? Do you seriously take this talent? Its soooo bad." Yes, yes I do, and no its not as bad as everyone paints it. I usually take this when I go dis just because its gives you more utility. Now most people that take this talent activate it and stay in it forever and throw games. That is not how you use it. You have to be safe when you pop it because there's a "ministun" when you activate it and when you deactivate it, so you can't just go in thinking I'll just E out right away because you can't. But if you learn how to use it and when to use it, this is a very good talent to pick, not just for siege and wave clear, but for teamfights as well. Pre-teamfight is when both teams start doing the pre-teamfight dance where they look for opportunities they can take to engage. Mostly during/before objectives, sometimes after or when same talent tier. W>Q on a single (squishy) target, if you land both, follow up with the proper abilities (usually R or E>R) to secure the reset. If there was a pre-teamfight usually your W will be on CD, if it is then just wait for it to go off CD then do the above, however if you can throw out a Q and it will be back up right when W is off CD then throw it. Don't misunderstand the title, this doesn't mean you go in (5-x)vs5. It means you can turn it around with picks into resets. If they are chasing and you can kill one of them, then turn around and do it. AA Li-Ming- with the variants being AACalam and AASeeker. These are the highest skill ceiling builds (imo), and I've been using them a lot instead of the usual Calaming or Missiles Li-Ming. AA Li-Ming just offers a lot of burst and guaranteed damage with your AA. They are very good against mobile comps. Calaming- Most popular Li-Ming build and for the most part I gave a rundown on this when I talked about Calamity in the talents section. Missiles Li-Ming- Outside of Calaming, this is the other build most people use. Very good against beefier lineups. As stated before, I think AA Li-Ming offers the highest skill ceiling for her. There are 2 variants for it depending on what you pick at 7, AA Seeker or AA Calam. AA Calam is probably my favorite build for her, with pre May 17 ZeiMirrorWoFRasha being the 2nd. Anyways, I will first post a heroesnexus talent calculator link and then explain the flex talent picks in the tier and use the same color code as I did with the talent section, if I ignore a talent, then I think its not worth picking with the build, or if you had to take it (for example Force Armor), you should opt for a different build instead. I'll start with AA Seeker. Astral Presence- Mana to keep throwing out missiles. 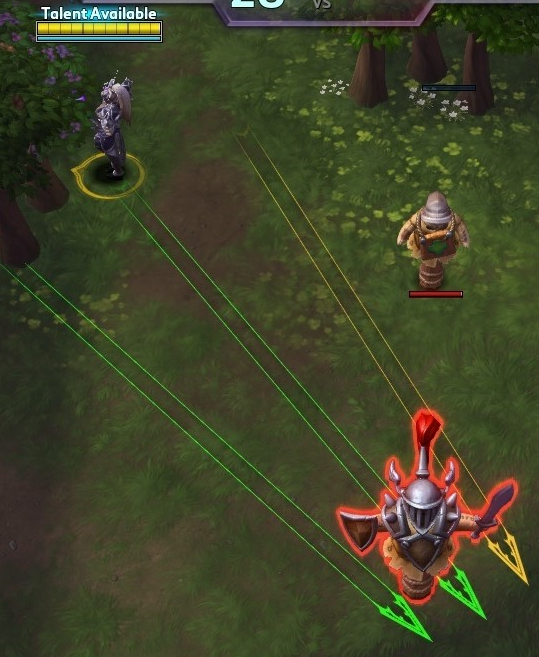 Force Armor- Take if needed against a good Zera or temp loop chromie, or other hard to avoid burst. AA Seeker over AA Calam if up against beefier heroes where getting the intial reset with calam isn't as easy. Diamond Skin- Defensive talent if you need it and only take it if you need it. From the time I started writing this (early October to now-December), my enjoyment for the game has severely dropped and I don't play it as much anymore and so that reflects the time I put into this. More I play = more time into this and likewise with less. I'd like to finish it at some point but as of now, I don't feel like devoting the time to put more into this, the game just feels really stale to me atm, and looking at the plans for season 3, I don't see myself playing that much either, if at all. One thing I'll be sure to do though despite whether I play or not is at least complete the talent picks for each of the builds although the in-depth part explaining the gameplay to each one might be...delayed.